Stanford boasts the reigning Women's Volleyball champions, winners of 2 of the last 3 NCAA tournaments. But what about the other two volleyball programs on campus? The men's program was upset at home in the quarterfinals of the MPSF tournament and the Beach Volleyball team has a losing record and was ranked 20th in last week's AVCA Coaches Poll. We're not even in the top 8 teams in CA. Beach Volleyball is only in its fourth season as an NCAA championship sport, but all three of the first champions have been either USC or UCLA. We can't really have those two trading championships, given our interest in staying at the head of the NCAA team title pack. So, what are the chances that we can start making some noise with the men's team and on the sand? Just watched the Jordan Brand Classic all-star game. It featured Jones, Belibi and Prechtel. Jones was the MVP of the winning team and the leading scorer. She looked very smooth driving to the basket. And Belibi looked great too, perhaps the most athletic player in an all-star game full of extremely athletic players. My guess is that Jones will start from day one and possibly Belibi by the end of the season. Lots of fun. Stay to the end. 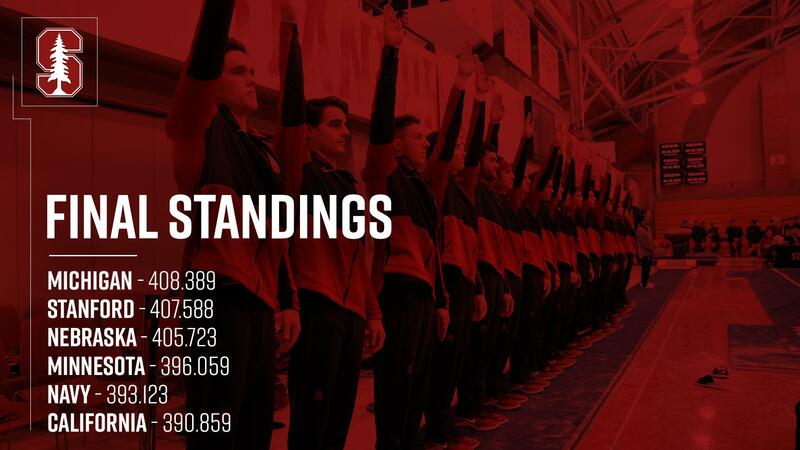 Men's Gymnastics advances to NCAA Championships Session, and Brings Home Title #120!! Stanford finished 2nd out of 6 in its semifinal session today. What are our chances of dethroning Oklahoma? Another walk-on put on scholarship! Congrats to DB JJ Parson! Brief video interview (very good) with Chiney on subject also in story.